Complete Acrylic Paint Set!! What A Deal!! ✓ THE QUALITY SURPRISES EVERYONE! Golden collection of 24x12ml paint set, 12 brushes, a sponge and a mixing art knife for such a low price? Most customers are surprised to see it's not a cheap art kit... but simply an affordable one. PERFECT AS CHRISTMAS AND NEW YEAR GIFT!!! ✓ 24x RICH PIGMENTS BRING OUT THE BEST FINISH FOR CRAFT: Quick dry acrylic paint glides like velvet on your favorite surface. Canvas, wood, styrofoam, plaster, terra cotta, ceramic, clay - no limits for handmade art! ✓ ENJOY OUR NO RISK 6 MONTH GUARANTEE: Beginners, long time artists, kids, and adults! Thanks for purchasing this incredible acrylic paint set (simple colors like black, white and red are never enough, right?). If you have any issues in the next 6 months, return for a replacement or refund. ✓ NOT JUST PAINT - A TOTAL ART KIT YOU CAN GIFT TO A FRIEND! It's our pleasure to gift you with 12x non-shed nylon art brushes (also good for watercolor and oil), mixing knife and art sponge with your acrylic paint. Enjoy yourself, or gift to an artist friend. ✓ SAFE AND FUN FOR KIDS 100% NON-TOXIC & QUICK DRY: Sponge painting is the favorite for kids! And thanks to the quick-dry technology you can hang their artwork on your fridge immediately. 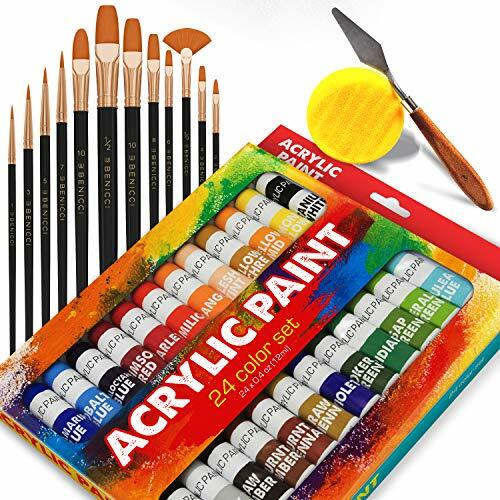 Enjoy your affordable acrylic paint kit of 24 paints (12ml tubes) +12x acrylic paint brushes + mixing knife + sponge. Order Now.